Anita Goodesign Trunk Show is Buy One Get One Free - final day! 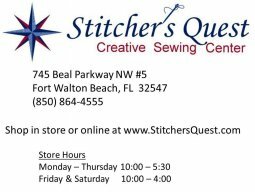 Stitcher's Quest will host this two-day BERNINA Academy event in Fort Walton Beach with BERNINA Educator Kate Toney. Learn how to successfully stitch professional techniques like piping, zippers, Spanish hemstitching, couching, fringe, and more! Learn practical and decorative techniques and discover ways to make sewing easier using proper feet, stitches, and features of BERNINA machines for precise sewing. We provide the machines, tools, and supplies for this event. A lunch is also included both days.